137. 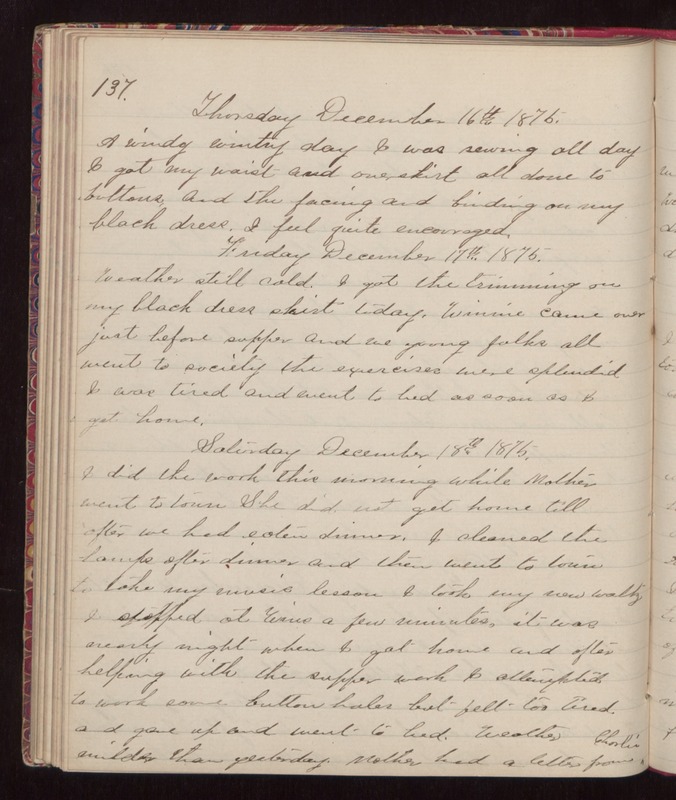 Thursday December 16th 1875. A windy wintry day I was sewing all day I got my waist and overskirt all done to buttons, and the facing and binding on my black dress. I feel quite encouraged. Friday December 17th 1875. Weather still cold. I got the trimming on my black dress skirt today. Winnie came over just before supper and we young folks all went to society the exercises were splendid I was tired and went to bed as soon as I got home. Saturday December 18th 1875. I did the work this morning while Mother went to town She did not get home till after we had eaten dinner. I cleaned the lamp after dinner and then went to town to take my music lesson. I took my new waltz I stopped at Wins a few minutes. it was nearly night when I got home and after helping with the supper work I attempted to work some button holes but felt too tired. and gave up and went to bed. Weather milder than yesterday. Mother had a letter from Charlie.